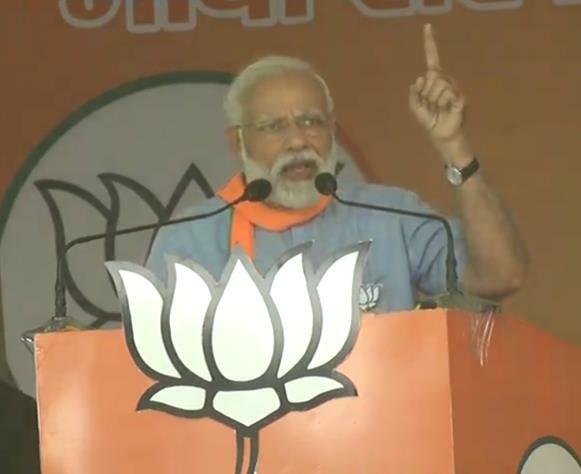 Prime Minister Narendra Modi on Sunday said it is due to the strength of Babasaheb Bhimrao Ambedkar’s Constitution that a man from a deprived and exploited class is president, a man from a farmer’s family is vice president and a ‘chaiwala’ is the PM. Modi also attacked the opposition alliance in Uttar Pradesh, asking how those not fighting all the Lok Sabha seats in the state can give a prime minister. It is the strength of Babasaheb’s Constitution that a gentleman hailing from deprived and exploited class has become the president (Ram Nath Kovind), while the vice-president ( M Venkaiah Naidu) is from a farmer’s family,” he said at a rally in Aligarh district, on birth anniversary of BR Ambedkar, the architect of the Constitution. In Uttar Pradesh, the Mayawati-led Bahujan Samaj Party (BSP) is contesting 38 Lok Sabha seats, while the Akhilesh Yadav-led Samajwadi Party (SP) has fielded candidates from 37 parliamentary constituencies. There are three Rashtriya Lok Dal (RLD) candidates in the poll fray from the state. The alliance has left two seats of Rae Bareli and Amethi for the Congress.